Out of all the teams that have conquered the stage, fate has decided that both South Korean teams would face again. This time, their match would be held in a foreign land away from the comforts of the OGN stage. If anyone ever bothered to bet that SKT and Najin Black Sword would somehow meet in the tournament, everyone else would say yes. It is no wonder that both these teams would meet in the Semi Final round after displaying amazing plays and skills in their previous matches. Now, all cards are on deck as they play against each other to quality a spot for the World Finals. Both teams have star players that know how to make plays when they need it. Faker has proven time and time again that he owns the mid lane. Both teams' AD carry also proved to the world that they can stand on their own as well. We have seen how much SKT's Piglet has come to his own in the Group Stage but he should not undermine the mechanical prowess of Najin's Pray. SKT came in to the World Championships only betting on Faker to do the plays but as they progressed all team members have been able to stand on their feet. SKT truly shines during the extended series where they would snowball their lane wins into a victory. Meanwhile, Najin Black Sword came out strong in the previous round but it would take a lot of effort from them to take down one, if not, the strongest team in the world right now. Fnatic and Royal Club both have different styles in playing their game. One is a well thought out strategic gameplay while the other has a hyperaggressive gameplay. This series just screams hype as both teams have been known to give the audience the satisfaction of watching a game turn on its head. Fnatic continues to claw their way into the Finals after defeating Cloud 9 in the Quarter Finals. Now, they will have to face one of the most aggressive teams in the world – Royal Club. Known for their tower diving mechanics and ganking abilities, Royal Club is a force to be reckoned with. Their previous match against OMG proved that they are not pushovers. With their match against Royal Club, Fnatic will have to come together as a team and not rely heavily on xPeke to make amazing plays for their team to get ahead. It is already known that Royal Club loves to make plays even down to their support player and in order for Fnatic to secure a spot at the World Finals, they will have to counter Royal Club's amazing hyperaggressive strategy. We have stated you the odds and available bets for the matches of the League of Legends World Championship Semi finals of esports bookmaker Datbet and online bookie Pinnacle Sports. While Pinnacle Sports is offering straight match bets for both semi finals Datbet is offering a lot of special bets like which team will take first Baron, when will first dragon be taken, which side gets first bloos, and many more esports bets. Please note that the odds visible here may have changed in the meantime. To find out more about betting on league of legends visist our Reviews of Datbet and Pinnacle. 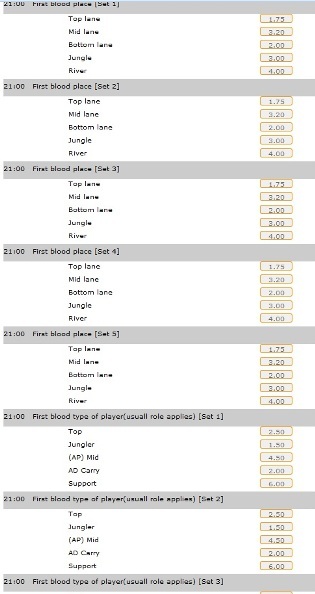 As mentioned above Datbet offers a great variety of bets for League of Legends. 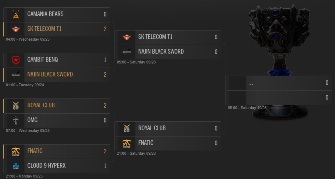 In fact there are more than 100 lines available for the match of Fnatic vs. Royal Club. We have a picture so you can view an outtake of the bets available on League of Legends.